You know you need to, and you might even think you are studying, but are you actually moving forward and raising your score? Are you truly getting something out of the time you are putting towards the exam or are you simply tricking yourself into thinking that you are making progress because you feel like you are spending time “working” yet nothing gets done and nothing changes? Procrastination takes many forms, so you may not even realize that this is actually just a manifestation of it. By identifying the time sinks that are masquerading as actual test prep, you will be able to clearly see the problems for what it is and implement the solution and finally implement solutions. Every day you create a To Do list on a Post-It note, yet you never quite make it to the point where you are studying. You have planned in a general way to study, and you know that you should, but you never quite get around to it. The solution for this issue is to block out your time. Use a calendar-- on paper, in your phone, or through Trello-- to actually schedule time for the formal test prep work that you are doing, and don't let anyone or anything interfere. Think out of it as a meeting that you absolutely have to keep, one that cannot be rescheduled or pushed back because it is of the highest priority. By shifting your mindset about test prep from something that you need to do each day, think of that hour as already accounted for. To make this work even better, schedule out this time digitally by using a calendar on your phone that allows you to set reminders. Give yourself a 15-minute buffer so that when the time you've set aside for sitting down for TOEFL prep work begins, you don't have any excuses to stop, like not having a pen handy or not knowing where your headphones are to practice listening. While the typical procrastinator continues to put studying off completely, this person is thinking about the TOEFL and even believes that he/she is working on it, but they have dedicated their time to the wrong thing. This is a serious trap, a trick that your mind plays on you because you genuinely believe that this is pushing you forward and helping you reach your TOEFL goal score. But once you look at it more carefully, it is actually a sneaky form of procrastination. Instead of making research part of your regular routine, limit the amount of time you spend looking for quality material and advice by taking cues from only the trusted sources mentioned and already organized for you in Trello for the TOEFL. This will help for a variety of reasons. First, you don't need to come up with the list yourself; it has been done for you, saving you tons of time. Also, these sources and links have been vetted. This means that you are only getting solid, valid information. But what if you realize you have a question while you are working through the practice material in one of your practice books? Don't stop right away to use the internet to find the answer. Keep a running log of questions that you've got. You can keep track of this in a Trello Board as well. This way you can batch it, looking for all the answers at once, or you may realize that some of those questions will eventually be answered by other information you come across in your test prep book. Don't spend all your time using Google to find the answers to your list of questions. Remember, you won't see that exact questions on the exam again, so don't feel like you need to understand the solution to each practice problem 100% especially considering that some questions are just not as good as others. Need a resource to answer any strategy questions or English language questions that come up? Fill out the form here as the best questions will be answered and featured in our newsletter. Don’t have enough time today? Tired after a long day of work? Going to start tomorrow because you already broke the streak of learning 50 new vocabulary words a day? Sometimes it is important to be gentle with yourself. Setting realistic expectations is necessary for keeping up with your study schedule. It is unreasonable to expect your overall TOEFL score to go up 50 points after one day of studying, for example. However, it is also possible to be too lenient with yourself. If you constantly find yourself meeting your friend for dinner when he/she texts you at the last minute instead of opening up your book, you might need to get tougher on yourself in order to commit to real, regular studying. In order to combat this problem, think about what motivates you. Can you reward yourself for a studying session by meeting your friend for an iced latte only after you’ve completed a practice test? Use an app like Productive to help you see and celebrate creating a streak of unbroken days of TOEFL speaking practice. Move things from list to list in Trello or use a checklist in order to visually see your progress. Are you putting off studying because you don’t believe you can actually get to that goal score? Does it seem so far out of reach that you have become so discouraged that you are just ready to throw in the towel altogether? Break the TOEFL into smaller tasks by type of question and by language skill. Is the issue a test-taking problem or is it a language foundation issue at heart? Build your confidence by beginning with independent questions first. You may want to practice reading practice passage in your area of expertise before moving on to other fields. If all else fails, act confident until you actually become confident. Make confidence its own habit. With regular practice, you won’t even have to think about it anymore. If you listen to podcasts about or read books or blogs about productivity, you probably know that one of the biggest lies that people tell themselves is that being busy is the same as being productive. The same concept applies to preparing for an exam. Although you might look at the sheer number of minutes that you are devoting to studying, you might realize you aren't actually applying yourself to this at all. Are you trying to study in a crowded coffee shop that is so loud that you have to re-read the same test prep tips over and over again? Do you find yourself opening your textbook only to start thinking about whether or not you fed your dog or start playing with the cat that keeps jumping on your desk? Do you start a practice test only to get distracted by a text that comes or a Facebook notification? Think about your environment. Turn off pop up notifications, silence your phone, and definitely do not have Netflix on in the background. It is better to spend a short amount of time entirely focused on the test prep advice or practice test than to spend a much longer amount of time in front of a test prep book as well as multiple devices, with your attention split in several directions. There are many ways that procrastination can hold you back from your TOEFL goals, and it may not even be obvious that procrastination is the culprit. Find the solution that tackles the underlying reason for the procrastination, and become a more productive test-taker immediately. Thank you! 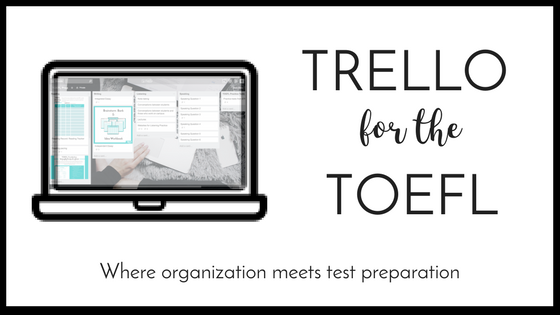 Click here for your Trello Boards, and be sure to check your email for more TOEFL tips.